Calbag Metals processes many scrap metal items domestically, instead of shipping them overseas. Our custom equipment delivers finished product that meets even the tightest regulation policy. Buck Mikely is the new face of metal recycling. You'll see him on buses around town reminding everyone that metal is found in more than just aluminum cans. Learn more about metals you can recycle and Portland artist Matt Gentry who entertainingly brings Buck to life. We make it easy to recycle metal. Our Portland, Oregon facility is conveniently located on the edge of the Industrial District in NW Portland. Easy access from the highway, dedicated staff, and convenient hours get you in-and-out quickly. No one knows scrap metal better! Our Tacoma, WA facility employs some of the most respected and experienced scrap metal workers in the industry. Whether you have a pick-up truck or semi-truck, you'll receive great service and our best pricing. Ordering drop boxes or scheduling a pick-up has never been easier. Calbag Metals offers a wide-array of options for getting scrap from your site to our door including; drop boxes, roll-offs, dumping hoppers, flat-bed trailers and dry van hauling. On any given day, Calbag Metals has millions of pounds of finished and prepared materials to sell. Our trading team, located in Portland, Oregon, is happy to share up-to-the-minute inventory information. * These are not recycling rates. Scrap metal pricing is different from ingot prices tracked and traded on the open market. Get quote. Got Old Electronics? Earn Money By Recycling With Calbag Metals! 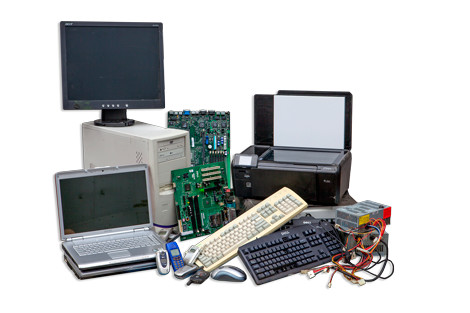 In addition to scrap metal, we also accept electronic equipment, from printers and office equipment to computers, hard drives, cellphones and cables. Got Steel? 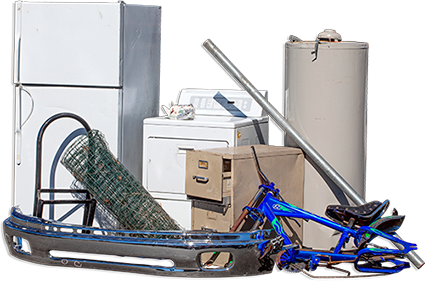 Earn Cash By Recycling Washers, Dryers, Bikes and More With Calbag Metals! Bring us your old bikes, file cabinets, chain link fences, car bumpers, wheels and other items made of steel. Don't see your item on the list? Need Help? If you have scrap to sell or question about pricing, what we buy or how to get the best price for your material, call us. Our list of recyclable items is always growing. Call us with questions. Want to learn more about metals? We have the equipment and tools to purchase, process and recycle every metal from Aluminum to Zericonima. We buy ferrous and non-ferrous metals. Check back often as this list is always changing. Dispose of your electronics properly and safely with Calbag. Electronics are increasingly a part of our daily lives. Calbag Metals ensures your devices are handled and recycled responsibly. and have been in business over 100 years.